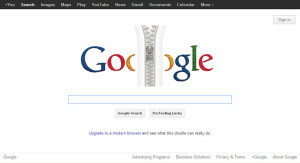 I saw the cool zipper on Google today. 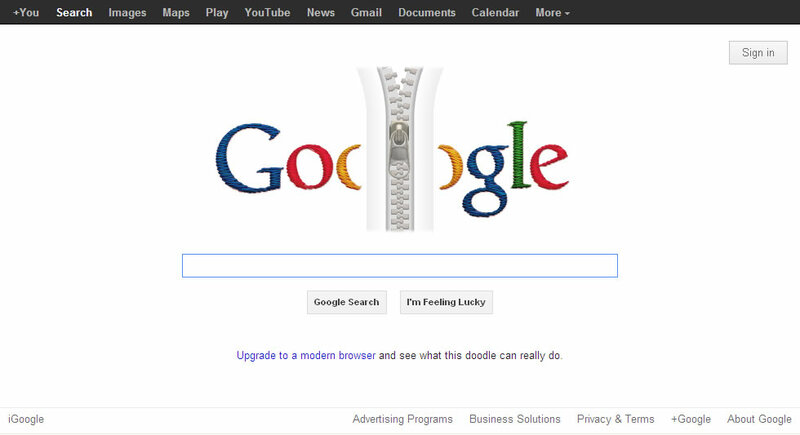 I played with it, wondered what was on the other side and was delighted it was a search for the inventor of the zipper. Later I needed to do something in a different browser and Google loaded as the default page. Where was my zipper? It was in the logo, but the interactivity was gone. "Upgrade to a modern browser and see what this doodle can really do." I know I haven’t upgraded IE in a while and though I am used to people making fun of Internet Explorer it is the only browser I have ever gotten to work on 100% of sites. They’re monopolying the monopolizer? Points for good form, but I wonder if this is another indicator of how Google will behave in the future.